At the moment, if you are reading this on a mobile phone, then you are officially a Geek. I can say this because the way to this page is a physical mobile object: me. Sadly, it also means that the rest of the page will be of no interest you you because you already know it. We are currently at a very interesting time in the development of the Internet. Mobile devices with Internet access such as the iPhone are just hitting the mass market. This does not sound very revolutionary. Compared to a comfy chair in front of a 19″ screen it sounds like a step back. In fact, the user now has a very interesting property that they never had before- location. And if web pages can also be given a location, or be made to respond to a location, then lots of interesting things become possible. Think about those handsets you get in museums and art galleries. They give you information about the object you are next to. Imagine if the Internet worked like that. How Do You Attach a Web Page to a Real Object? There are lots of ways. The way I did it was with a type of barcode. Like the ones you see on, um, everything. Barcodes hold information which the barcode reader uses to examine a database. A web page with information. A barcode storing the page's address. A physical object to slap the barcode on. A barcode reader to get the web address. A browser to display the page. All I needed was a piece of Quick Response (QR) code. QR code is 'big in Japan', which means that either it will be big here, or it will disappear without trace. My next obvious step was to tattoo this onto my forehead. Unfortunately, the tattoo parlor was shut so to make my deadline I had to make a tee-shirt instead. 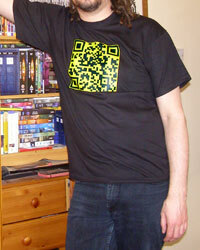 Now, the clever bit: getting from the tee-shirt to the blog. This is possible because modern mobile phones are small computers that have cameras and browsers. The camera sees the QR code. The computer extracts the web address. The browser displays the page. Actually, there is a little cheat here. The phone needs software to read the QR code which you need to know about and download. But this is already very common in some parts of the world. In Finland for example, this technology is used to tell people standing at bus stops when the next bus is due. Alas no. Two things will probably happen with mobile phones that will make the solution redundant. The first is that Optical Character Recognition will improve to the point that the phones will be able to read printed text. The second is that the ability of phones to know where they are will improve to the point that they will be able to search the Internet for pages that relate to them. (Postcodes are already appearing in metadate to help with things like this). But this technology certainly has the power to introduce the potential of the mobile Internet to the masses.